Nigerian Content Development and Monitoring Board (NCDMB), has concluded arrangements to host its second edition of the Nigerian Oil and Gas Opportunity Fair (NOGOF) themed “Maximizing Investments in The Oil and Gas Industry for the benefit of the Nigerian People”. At NOGOF press conference in Lagos, the Executive Secretary of NCDMB, Engr. 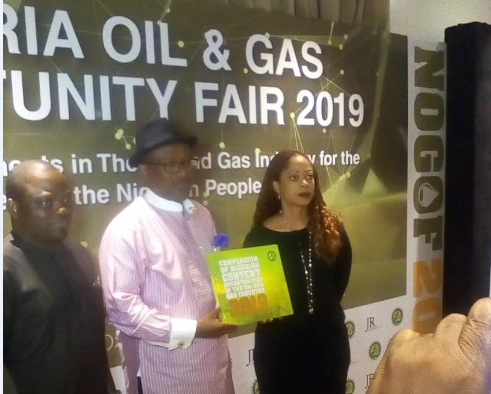 Simbi Kesiye Wabote, presented the Compendium of Nigerian Content Opportunities in the Oil and Gas Industry, a large size hardback coffee table book that contains all the current opportunities in the Nigerian oil and gas industry. The maiden edition of NOGOF was held in Uyo, Akwa Ibom State. Over 1,200 delegates, 33 exhibitors in attendance including presentation of industry opportunities covering engineering designs, pipe construction, facility upgrades and projects of various segments of the industry. “We discussed Brownfield and Greenfield opportunities at the fair and inspite of the challenging business environment during that period; we are able to provide a platform for industry players of the inherent opportunities in the sector. “This year event will be spectacular with the current stability in the industry and the current oil price. During the Practical Nigerian Content, NCDMB made a commitment that it will encourage the participation of female gender in the oil and gas sector. “This event is been organized by a female which tells us that we are fulfilling our commitments and we believe that with this approach, it is going to be spectacular, and from what i have seen, it is promising to be a great event. “We have put all things together to make sure we bring all the players in the industry from upstream, midstream and downstream sector of the Nigerian oil and gas industry. The potential benefit of NOGOF is also aligned on NCDMB’s action plans to include oil producing communities into the oil and gas value chain, fostering institutional collaborations, maximising participation of Nigerians in the oil and gas industry, linking oil and gas sector to other sectors of the economy, maximising the utilisation of the resources to attracting investments into the sector. NOGOF 2019 will be held in Yenegoa, Bayelsa State within the premises of NCDMB headquarters on 4th – 5th April, 2019.